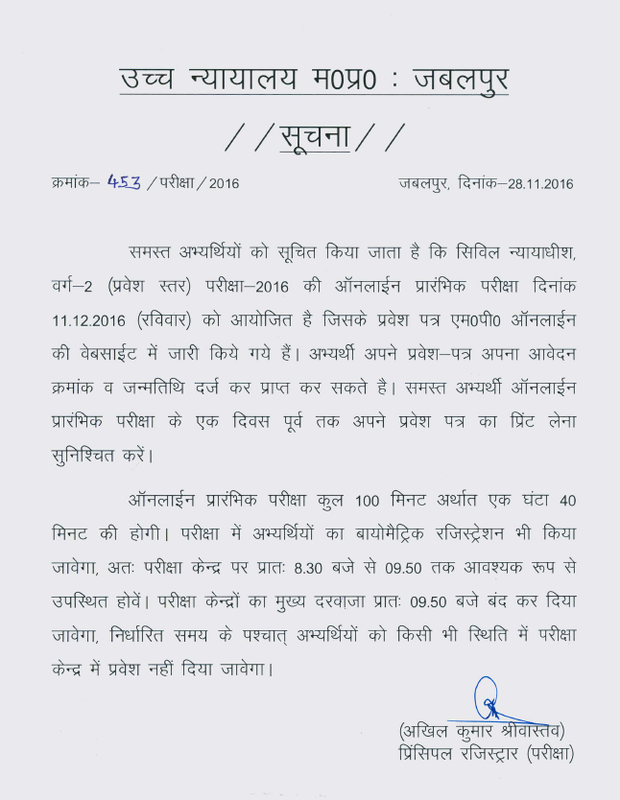 Madhya Pradesh High Court, Jabalpur will organize Civil Judge Pre Exam on 11 December 2016. Now MPHC Exam Admit card are available for those who want to give the examination. You can get them from below given link. MP High Court, Jabalpur is going to conduct Preliminary exam on 11.12.2016 for Civil Judge Class-II Entry level posts. For that, admit card can be downloaded now. You can know MPHC CJ roll no. from here through the official website mphc.gov.in. The written examination consists of 100 marks with 1 hour 40 minutes time. Questions are to be asked from General Knowledge, Computer Knowledge, English Grammar and act related etc. In order to download the admit card for MPHC Civil Judge exam, visit above link and enter your application no. and password (DOB in dd/mm/yyyy). Your MPHC CJ Admit card for Pre Exam will be shown and its printout should be taken.